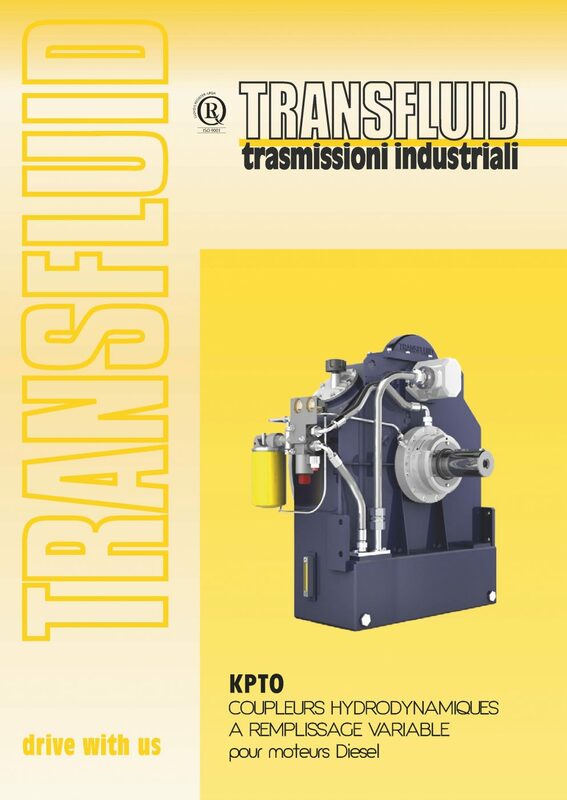 The KPTO is a fluid coupling enclosed into a box connected to the Diesel engine by SAE housing. 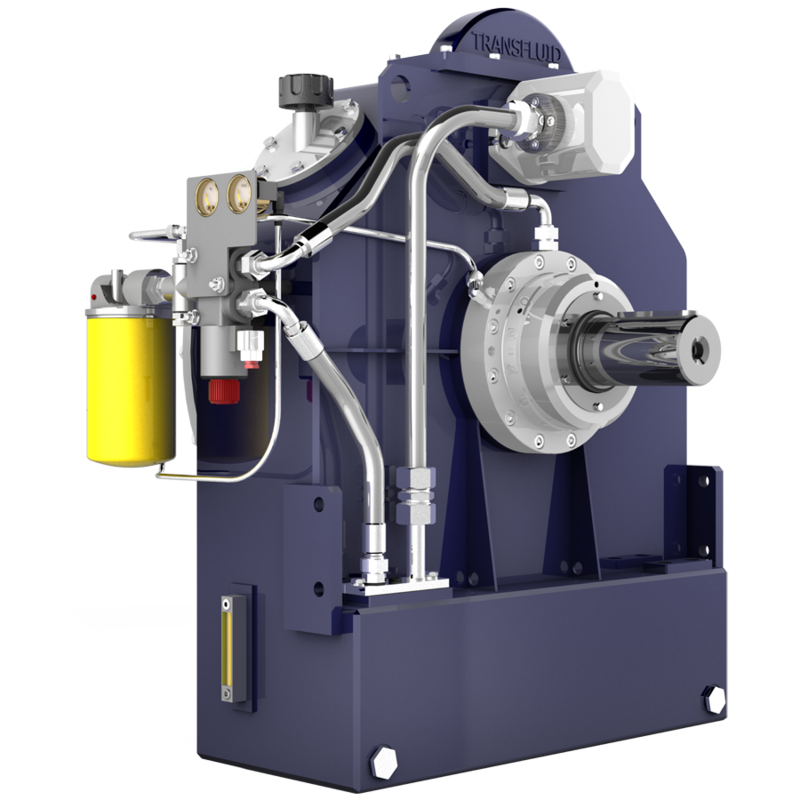 The KPTO has been designed to meet the market requirements for a unit combining the technical features of a conventional Power Take Off with the performances of a fluid coupling. The KPTO has an integral feeding pump driven by the Diesel engine. A remote electrically operated ON-OFF valve allows the fluid coupling circuit feed when turned ON and a rapid oil drain through orifices located on the periphery of the fluid coupling when turned OFF. The forced bearing lubrication is continuously assured. The KPTO range is suitable for powers up to 1000 kW. The engine flywheel is connected to the KPTO input by an elastic coupling. The output shaft can be connected to the driven machine by elastic coupling, cardan shaft or pulley. Standard accessories include: oil feeding pump, oil filter with pressure and temperature gauges, ON-OFF electric valve, oil temperature switch and oil level indicators. Optionals accessories include: water or air heat exchanger, quick release valves, output pulleys, elastic couplings, output flange for cardan shafts and cardan shafts too. The management system MPCB is a device developed by TRANSFLUID, both in the hardware and software, able to manage the different functionalities of KPTO fluid coupling; it allows the engagement or disengagement of the KPTO depending on the different operational profiles, measures the torque and the power transmitted from the coupling and performs the task of system diagnostics. The pulley on the output shaft runs a crusher. On the input shaft an elastic coupling is mounted which is attached to an internal combustion engine. The pulley on the input shaft operates a small generator of the crusher. Transmission for a mill which prepares raw material to produce ceramic tiles. The fluid coupling transmits the power through a 90° gearbox by a series of belts to operate the crusher. The KPT allows the connect and disconnect of the crusher and continually absorbs the shock and overloads typical of this application. The increase in life of the belts and gearbox and the reduction in fuel consumption are only a few of the many advantages of the KPT. The versatility and sturdiness of the KPT fluid coupling makes it particularly adapted for heavy duty installations where a normal PTO would be damaged in a short period. The maintenance requirements are another high point of the coupling. In fact, only a periodic substitution of the oil and filter are required. There are no special regulations or greasing needed and there are no frictional power transmitting parts to replace. Transmission to a wood chipper from an internal combustion engine. The KPT coupling transmits power through pulleys mounted directly on the output shaft. The overloads and spikes typical in these applications are absorbed thus protecting the transmission. Group mounted on a wood chipper during the revisional phase of the machine. Trituratore azionato da motore endotermico dove il giunto idrodinamico KPT, oltre a consentire un avviamento graduale del pesante rotore, assorbe gli inevitabili urti e continui sovraccarichi propri di questa tipologia di macchine operatrici. La versatilità e robustezza del giunto idrodinamico KPT lo rendono particolarmente adatto per impieghi gravosi dove le normali prese di forza a frizione si danneggerebbero irrimediabilmente in poco tempo. Per questo tipo di macchine, non è sempre possibile avere a disposizione un tecnico specializzato per eseguire le manutenzioni. Il giunto idrodinamico KPT necessita solo la sostituzione periodica della cartuccia filtro olio e dell’olio. Non ci sono regolazioni o ingrassaggi da effettuare, non ci sono componenti di attrito da sostituire o rigenerare. Per le macchine destinate al noleggio, la manutenzione è spesso trascurata dagli utilizzatori, è necessario scegliere componenti che garantiscano la massima affidabilità nelle condizioni più gravose e che possano funzionare a lungo senza continue operazioni di regolazione, ingrassaggio e manutenzione. Il giunto idrodinamico KPT soddisfa in pieno questi requisiti. Gruppi di comando propulsione su ferry boat veloci in servizio in Scandinavia. I gruppi sono dotati di valvole a scarico rapido che consentono un veloce disinnesto del giunto, sistema di lubrificazione ausiliario che viene azionato dall’elica stessa in caso di avaria del motore endotermico. Gli scambiatori di calore installati a bordo sono adatti per impiego con acqua di mare e sono dotati di valvole termostatiche che consentono di mantenere costante la temperatura dell’olio. Command group for a crusher powered by an internal combustion engine. In this application the noise level of the KPT is small enough to eliminate the need to extend the sound absorbing cover of the motor. It can be noted the compact nature of the KPT which is very convenient in limited space applications. Main drive group for a large crusher. In these applications normal power take-offs are not recommended, however the KPT coupling is well suited. The numerous advantages available from a KPT are seen throughout the drive chain by protecting and increasing the life of the system. These advantages reduce the down time and maintenance time. Thousands of applications have demonstrated the high sturdiness, reliabilityand validity of the Transfluid fluid couplings. The Transfluid fluid couplings increase the life of the entire drive chain because of its capabilities to absorb shock loads, overloads and torsional vibration. The coupling’s properties also reduces exhaust fumes and fuel consumption. Centrifugal pump control for a small tanker to pump hydrocarbons. The KPT coupling receives its input from the opposite side of the internal combustion motor and runs a centrifugal pump for the movement of hydrocarbons. During normal operation the motor serves as the ships propulsion and therefore the KPT operates as a clutch. When pumping is required the KPT is connected gradually by an electrovalve. It is possible to operate as a starter or as a speed controller. A stationary drive train for crusher. In this application, since the loads were high, caused by a small pulley with many belts, the pulley was mounted between bearings and connected to the fluid coupling through a toothed coupling. In most cases the pulley is mounted directly on the KPT output shaft which has a high radial load capability. Transfluid asks for necessary application data to calculate the bearing life for each application. A drive system for a crusher powered by an internal combustion engine. It is obvious the relatively small dimension of the KPT in the system which is comparable to a power-take off with friction plates (photo 1). The installation is very simple as the KPT is directly flanged to the flywheel housing and coupled to the motor through a special elastic coupling with high elasticity, eliminating the need of a pilot bearing mounted in the flywheel. The crusher is powered by a pulley directly mounted on the KPT output shaft (photo 2). The size of the pulley clearly indicates the capacity of the KPT to support radial loads. With the installation characteristics, Transfluid can calculate the bearing life of the application. In applications where the traditional power take-off with friction plates is not recommended the KPT is the obvious choice. Numerous advantages are introduced by the use of the KPT, and these advantages are realized throughout the drive train. These advantages include the protection of the drive train and reduction in down time. Thousands of applications in different sectors have demonstrated the sturdiness and high reliability of the Transfluid fluid coupling. The dimensions of the fluid coupling are very compact when compared to that of the internal combustion engine or the complete machine. These characteristics make it possible to use in limited spaces where the machine cannot exceed certain limits because the equipment must circulate on normal roads (photo 4). Ceramic industry plant for mixing run by an internal combustion engine (photo 1). Two couplings running a conical mill for the mixing of raw material and the running of the drying fan (photo 2-3) and the heat dissipated by the heat exchangers and the motor is recuperated in the form of hot air and utilized for the manufacturing process.